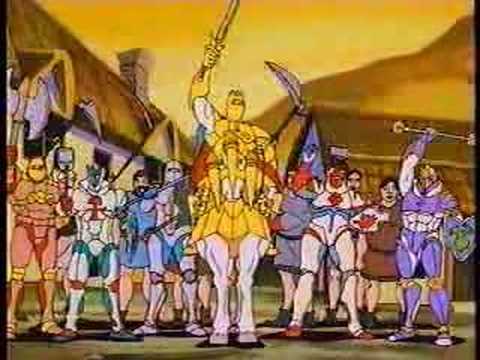 For your second heap of 90's awesomeness, let's take it back to 1992 for syndicated animated series King Arthur and the Knights of Justice. I grew up watching this show and really dug it, one year I fashioned a Sir Gallop costume for Halloween out of cardboard, string, sweat pants, PVC pipe and a couple of baseballs. It's been ages since I'd watched the show but a friend had recently rediscovered it and I'm now 6 episodes back in. After a rollicking electric guitar heavy, 90's rock theme song, the series starts with King Arthur and his Knights having been captured by the evil Queen Morgana and imprisoned within some diamonds in a cave. Wizard Merlin is unable to free the ruler and gazes into the future, coming across Arthur King, a likable quarterback from modern times and his football team The New York Knights. On their way home from a victorious game, the 12 football players take a shortcut in the rain and end up transported to Camelot. Merlin enlists them to free the true King Arthur which will require finding the 12 Keys of Truth. Being a bunch of city boys, the football team can't fathom how they'll be able to protect the kingdom while they search for the keys. Luckily the magic round table gives them each armor, weapons, a specialty item that can be summoned and the skills to fight and ride. The team pledges "fairness to all, to protect the weak and vanquish the evil" in order to receive a He-Man-esque transformation and go out to kick Morgana's forces in the pants. Lord Viper leads the huge and powerful if dumb Warlords who have names like Axe, Bash and Blackwing. Both sides have armored steeds decked out with projectile spears, battering rams, smashing wrecking balls and catapults. Each episode sees the Knights go on a mission to help nearby townsfolk or locate a key of Truth. The characters are pretty broad with the fair and leveled leader of Arthur, big dumb guys Trunk, Brick and Phil then the I-talian builder Tone, geeky Asian Zeke and fast talking Sir Breeze among them. Tone was always my favorite for some reason, it must have been it his overblown accent and ability to build the Brooklyn Bridge in half an hour. The action is entertaining as swords clang, stuff gets launched everywhere, Warlods knocked off horses, etc. No beheading action but you know, this is Saturday morning stuff here. The fantasy aspect is played up with a magical unicorn who talks through mind bullets, dragons in caves and the like. Then you get some basic morals as one knight finds his courage, kids stand up to overwhelming odds, Arthur puts himself into knowing danger for the benefit of others, etc. Sure a lot of it doesn't make sense (why would you take a shortcut during a horrible storm? Why are there only 12 players? Why would one of them be the bus driver? Why are they so cool with being forced into Merlin's plan?) but it's a cartoon, folks, just go with the randomness and enjoy it. King Arthur and the Knights of Justice ran for two 13 episode seasons in 1992 and 1993. I can't recall season 2 where they face off with Asian influenced enemies so it will be cool to watch or rewatch with nearly fresh eyes. 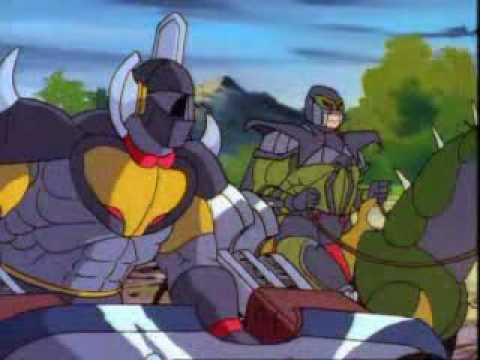 I remember some really ugly figures from Mattel of Viper, Arthur, Lancelot and Darren which seemed like rejects from Masters of the Universe. Then again the line did reuse the Slime Pit and one of the vehicles so I'm probably not far off. Marvel Comics put out a three part series and a SNES video game hit in 1995. You can pick up the entire series on DVD for a cool $8 from Amazon and relive the glorious 90's with me. "Knights, Knights, Knights! Yeah! Knights, Knights, Knights! Break it down!"